Despite the staunch protest by his own party men Dr. Pranab Mukherjee remained resolute in his decision to participate in the closing ceremony of the Tritiya Varsh Sangh Shiksha Varg of RSS. His conviction in the democratic principle of open engagement is worth acknowledging with gratitude. During his visit to Nagpur, the former President visited Dr Hedgewar’s ancestral home and offered homage to a man he considered “a great son of India”. He also paid his respects at the “Smriti Mandir”, dedicated to the memory and service of Dr Hedgewar and Shri Guruji at the RSS headquarters and went on to place his thoughts before the gathered audience with unflinching honesty. Before the program and away from the camera lens there was a meet and greet program with senior RSS functionaries and the special invitees, in which he participated with endearing simplicity. At the time of personal introductions, he suggested to have self introduction and leading by example offered a simple introduction, “I am Pranab Mukherjee”. For a man who needs no introduction, his simplicity was heartwarming. Pranab Da had come with a written speech in English whilst RSS Sarsanghachalak Dr. Mohan Rao Bhagwat spoke in Hindi, however both speeches met at the confluence of – Ekam Sat Vipra Bahudha Vadanti – “That which exists is ONE sages call it by various names.” Furthermore, Pranab Da explained very clearly that Bharatiya concept of nation based on a unique integral view is entirely different from the state-nation concept in the West. He emphasised upon our 5000 year old civilisational history with eloquence; highlighting the beliefs embedded in our view of life – Vasudhaiva Kutumbhakam and Sarve bhavantu Sukhina - values of diversity, secularism and tolerance, which are further enshrined in our constitution. Dr. Mohanrao Bhagwat also expressed the same views in different words. Instead of ‘tolerance’ he used acceptance of all. He emphasised that no Bharatiya can be treated as ‘other’ or alien as we all come from the same ancestors. Both the stalwarts emphasised in their speeches that national life of Bharat did not flourish on the basis of one religion, language or race but on the basis of spirituality based integral and holistic view of life and the values stemmed out of it. 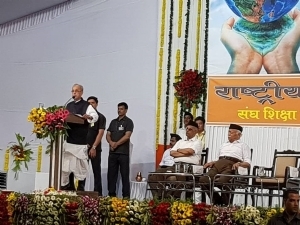 Dr Bhagwat also clearly articulated that the Sangh would remain the Sangh and Pranab Da, Pranab da as this is the Bharatiya tradition of acceptance, neither imposition nor appropriation but acceptance. This very view of life and value system is reflected in our constitution. This humane worldview is also our greatest inheritance.Our neighbour Pakistan (which was once a part of Bharat) also wrote it’s first constitution at the same time. However their constitution does not speak of these values that are inclusive, it does not take note of the inherent diversity, neither does it celebrate it. Now the obvious question that arises is that when both were one country and one people, then why did this distinction in going forward emerge? Similarly, we are traditionally liberal, secular and inclusive not because of our constitution but our constitution has enshrined these values because we have been like this since ages, at least 5000 years. Hence, it is our duty to honour and follow the Constitution. The RSS has stayed steadfast in this pursuit. Despite the unfair, unjust ban on the RSS imposed by the then regimes twice, the stayagrah that was carried out in protest was literally countrywide, disciplined and peaceful, an unparalleled example of protest in the history of independent Bharat, and one that was absolutely Constitutional. No other organisation or party can claim such a history. But consider the dissonance, those who violate every tenet of the Constitution, take the path of violence, attack our own armed forces, and those who support the divisive, unconstitutional activities are the one to preach the constitution to the RSS. On April 2, this year, the “Bharat Bandh” in the six BJP ruled states only, witnessed despairing scenes of unprovoked violence that was actively supported by Rahul Gandhi and the “secular-liberal” lobby, without any consideration for the Constitutional and Democratic values proposed by Dr Babasaheb Ambdkar and enshrined in our Constitution. However it is important to note that critics of Pranab Da’s visit to Nagpur had nothing to say of Dr Bhagwat’s speech. It’s possible that they didn’t hear his speech, maybe it wasn’t worth their time, after all this was in sync with their elitist definition of “free speech” – which prescribes that all they say is correct and all else is false. We are right and you are wrong just on the lines of “Four legs good, Two legs bad’”, the famous analogy used by George Orwell in his famous novel ’Animal Farm’ exposing the authoritarian tenets and hypocrisy of the communists. Hence listening to “two legs” would obviously be blasphemy! The inclusiveness of “Vasundhara Parivar Hamara” (The song recited before the speeches in Nagpur) includes everybody, even those who practice intolerance. But those who believe “four legs only are good” would prefer to reside in their darkness of ignorance. In all those negative articles that followed, not one spoke of their own experience. As to be in conversation with the RSS is considered blasphemous, and results in instant ostracisation amidst the “liberal left” (an oxymoron). Under such pressure, paying heed to what the RSS Sarsanghachalak says is not even an option. - Is your opinion based on your own experience? - Have you ever met with a Sangh functionary? - Have you read any literature from the RSS? They invariably get answers in negation. During my routine tour when I was in Agra, this couple insisted that I should stay with them. They also arranged my meeting with the Bishop there. We went to Bishop’s office and the meeting went well. But we can’t expect such openness from the Left inspired RSS haters. In our “inclusion” of all we also include these “intolerants”. But in their (intolerant) tolerance they cannot tolerate we the “inclusive”. During his travels the Sarsanghchalak of RSS often meets influential people from all walks of life. During one such interaction he met with a famous industrialist, who suggested that in place of using the word “Hindu” the Sangh should use the word “Bharatiya”. But in the dogmatic and fascist world-view of communists these values, so Bharatiya in their essence hold no significance. Their tribe insists that the lingua franca permits only words like secularism, Nehru, Marx whilst Hindutva is a pejorative. Should you deviate from this language, then even the right to live is denied. You are not even worthy of being tolerated, let alone be engaged with. In Kerala the red bastion of communist intolerance and a Stalinist enclave, from March 1965 till May 2017, over 233 RSS workers have been killed for the only reason that they were working for RSS. Significantly, 60 percent of them were ex- communists. As many times as you may try and explain the idea of Hindu Rashtra and its true meaning, the communists and left leaning “intellectuals” sans engagement and debate and will define it as only narrow, divisive and exclusive. They will quote some old letters, or an article - cut, copy paste and reproduce, without historical context or deliberation. They will never see what the RSS leaders have been saying during these years till today. The reason is simple – “Two legs bad”! However, just because they choose to look away and obfuscate at every given opportunity, the irrefutable fact remains that there are Muslims and Christians in the RSS. As Hindus we do not believe in conversions, hence these Swayamevaks for years together keep following their religious practices as Christian or Muslim. In 1998 there was a 3 day camp of Vidharbha Prant ( a Part of Maharashtra) where 30,000 Swayamsevanks participated in full uniform, stayed in tents. These camps normally take place only over the weekend and for those who observe fast on Saturday, to make arrangements for special food the head count is taken. During the exercise, it emerged that it happened to be the holy month of Ramzan as well and there were 122 Swayamsevaks who were keeping Rozas and needed to break their fast at late night. Accordingly, arrangements were immediately made to facilitate this. Had there been no Ramzan, no one would have noted that there were Muslims among Swayamsevaks in the camp. These are stories drawn from real life experience, which do not make it to the hallowed pages of mainstream publications, however if you observe carefully and eschew the rhetoric that is peddled, the stark, intolerance and fascist approach to heterogeneity of ideas is clearly visible and increasingly stands exposed. They say Pranab Da has shown the RSS a mirror, however the Sangh is quite open to looking in the mirror and does so every year at the Chintan Shivirs and Pratinidhi Sabha! In these meetings a careful examination of the activities undertaken and necessary course correction is deliberated upon. Such a meeting took place as recently as the month of April in Pune. But when will left-liberals who stake claim on the progressive values of inclusiveness but display every aspect of intolerance in their actions – look in the mirror? Whether they choose to look in the mirror or not, their truth is reflected in their actions and the public continues to take note of the rampant hypocrisy, between words and actions. On a lighter note – one must express gratitude, had it not been for their shrill display of intolerance, the media would not have turned the lens on a program that is an annual event and always invites distinguished guests as speakers. Thanks to the intolerance of communists and those inspired by their hollow rhetoric, the general public got to witness a live transmission of the program. From the 1st to the 6th of June the official RSS website “Join RSS” received (average)378 requests per day, however on the day of the program, there were 1779 requests. Need one say more?